When you hear "Big Apple" do you think of New York, or do you think of a comfortable ride on your bike? Schwalbe has billed their Big Apple tire as "the tire with a built in suspension." They've recently teamed up with several bicycle manufacturers and launched balloonbikes.com, a site featuring Big Apple-equipped bikes. The Big Apple has had recumbent fans since it came out. Let's face it, most people choose recumbents because they are more comfortable than the alternative. Even with the comfortable seats, we still have to deal with bumps in the road. On a trike with a stiff aluminum frame this becomes even more of an issue when traveling on less-than-perfect roads. We used the 20x2.00 sized tires because they fit on the stock rims very well. Schwalbe also makes a 2.35 width. To really appreciate the Big Apples, I decided I had to try them a variety of different ways. First, to fully realize the full benefits of the Big Apple tires, I equipped a Cruiser with three of them. Next, I put all three Schwalbe Big Apples on an aluminum Access. And finally, I replaced the rear tire of my Race with a Big Apple and left the Stelvios on the front. In order to get a varied viewpoint we shared the trikes and took turns commuting on them. For our tests, we mounted the Big Apples to the stock wheels. They fit very well on the stock aluminum wheels as well as the Velocity AeroHeats found on the Race. Because these tires are so large they do take a little longer to mount than some other tires we've used. Make sure that you use a tube that will fit properly like the Schwalbe SV7. The only issue we had with the Big Apple mounting was dealing with the fender on the rear wheel of the Race. Ultimately we had to raise the fender about 3/4" to get it to clear enough to put the wheel back on the trike. 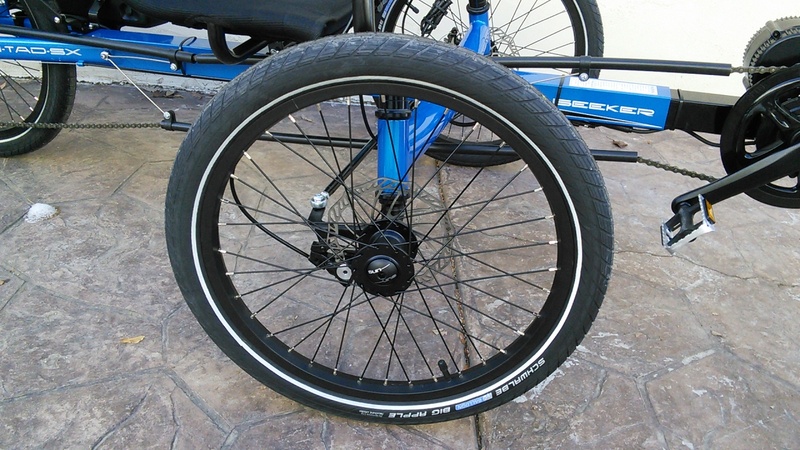 Once the tires are on the trike you can definitely see the difference. Because of the size of the tires the trike is actually raised by about half an inch. The wider rubber definitely makes the front view of the trike seem more substantial. One thing that is unique about these tires is that the Big Apples have a very wide range of permitted air pressures. With such a tremendous volume of air in the tire you can go as low as 30psi, while the upper limit is 70psi. For our testing we filled all the tires to their max pressure of 70psi and rode that way for a week. Then for the next week we lowered the pressure all the way to 30 psi. For our final testing we did some controlled rides while changing the pressure level 10 PSI at a time. The general consensus is that riding with the tires filled to their max pressure does not feel significantly better than most other tires we ride with. But, the magic happens when you lower the pressure. Finding your perfect pressure may take a couple days, but just like that Sleep Number Bed, you'll know when you get it. The lighter members of our test group found that pressures of 30-45 PSI were the most comfortable. I, being the heaviest of the group, found that 50 PSI was perfect for me and my regular load. The key here is to test it out and try different pressures. Schwalbe doesn't rank the Big Apple tires at the top of their speed chart, but they are not a slow tire. I found the Big Apples to be just as fast as the Marathon tires at their highest pressure. At the lowest pressure they felt a little slower for me, although not all the members of our group felt that way. Because these are such a wide tire I found the rear tire would scrub/squeal a little on high-speed turns. At more casual speeds I had no scrubbing. I actually found that on really bumpy roads I could go faster with the Big Apples than with the "faster" tires. As a test I went down a particularly bumpy road and barreled down as fast as I could with the Kojak/Stelvios, Marathons, and Big Apples one after another. With the racing tires I had to take the succession of ruts slower to avoid being thrown off the trike. With the Big Apples there was enough suspension to allow me to plow right through. Another aspect of these tires that may affect speed is that the larger size will raise your gearing by about three gear inches. I definitely found that my gearing felt a little different, especially going down hills. The tread pattern of the Big Apple tire wraps around most of the tire, which is great for two-wheeled cycles that lean when they turn. 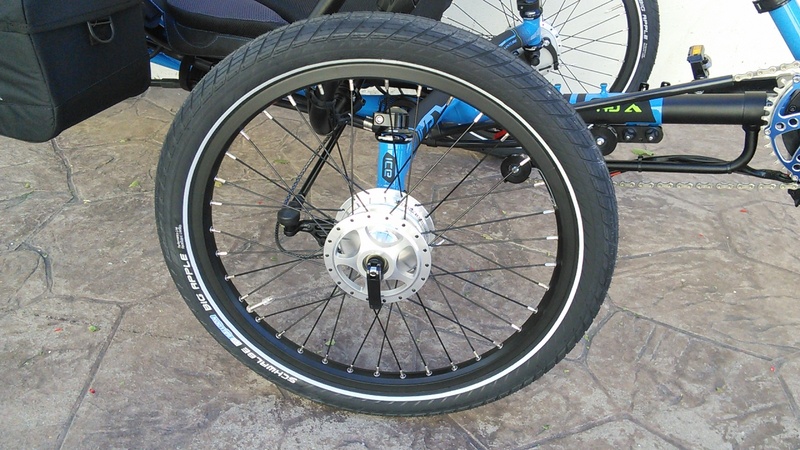 On trikes, the contact area of the tire is limited to the center region of the rubber. I found that grip on the road was very good even when wet. The tread is rather shallow though and the back wheel did slip some when riding through sand. The width of the tire is more than enough to make up for this on most terrains though I would think. Schwalbe has revised the latest generation of these tires to include their famous KevlarGuard protection. It must work seeing as not one of us had a flat with the Big Apples during our tests. The rubber compound used seems to repel thorns pretty good, as I rode through a patch of thistles once and nothing stuck. As for durability, the Big Apple that I eventually put on the back of my Race currently has about 600 miles on it and still looks almost new. These tires should last a long time. Many people will run the Big Apple tire on the rear wheel and run other tires on the front. I assumed that this was generally done to balance the comfort and speed. After testing this out myself I found this to be a very valid solution. For my own testing I ran the Big Apple on the rear and the 120 PSI Stelvios on the front. I found this to be very comfortable and still had speed nearly equivalent to running the Kojak on the rear with the Stelvios with the Big Apple at full pressure. The main difference was in the cornering as mentioned above. Running with three Big Apples is an absolute blast though, as the trike behaves like a totally different machine. Terrains that felt to bumpy are smoothed out by the built in air suspension. Small potholes and bumps are hardly noticeable. The main disadvantage will be getting front fenders to fit if you need them. When choosing tires for your trike there is always a compromise. If you want something super fast and lightweight, then you should go for the Stelvios or Kojaks. If you want a great all around tires then go for the Marathon or Marathon Plus tires. If you want the ultimate in comfort for 'round town cruising then choose the Big Apples--you won't be disappointed. P.S. If you are into shooting video then you will appreciate how well the Big Apples smooth out the shots from any trike mounted cameras.